Charlie Saltkield won't vote for Hillary Clinton in November for one reason: She badmouthed coal. Saltkield doesn't even work in the coal industry. He owns Charlie's Cycles, a motorcycle shop in southern Ohio, about an hour south of Columbus. He's exactly the kind of voter Clinton should be able to woo: He grew up a Democrat and he's "done OK" in the Obama era. But Donald Trump gets Saltkield's vote this year. "My dad was a coal miner. You can't go against the coal miners. 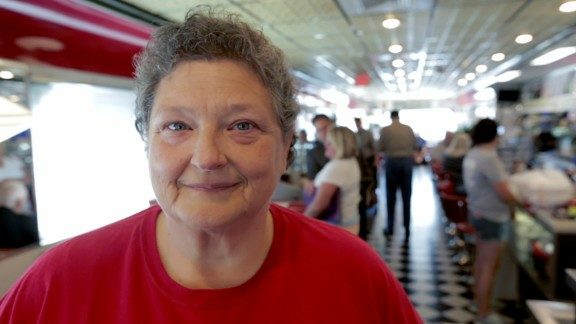 It's my heritage," Saltkield told CNNMoney over lunch in mid-September at Diner 23 in Waverly, Ohio. 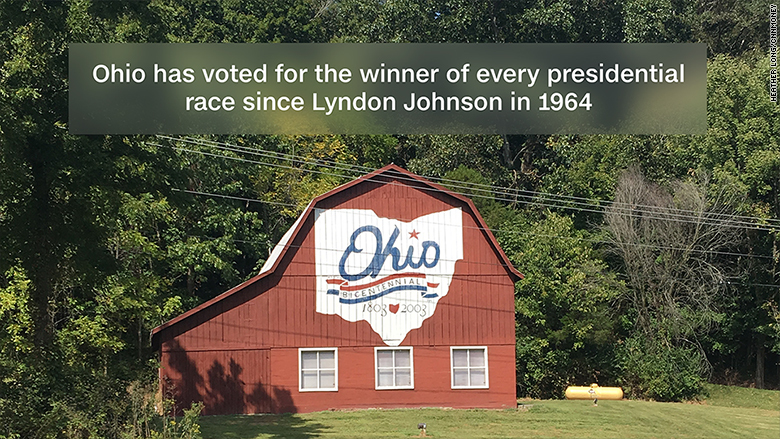 Ohio has voted for the winner of every presidential race since Lyndon Johnson in 1964. It's the reason people say, "As goes Ohio, so goes the nation." The usual voting blocs in Ohio are muddled this year. Union and coal voters like Saltkield are crossing party lines to vote for Trump. Meanwhile, some Republicans, including Governor John Kasich, just can't stomach Trump. On top of that, basketball star LeBron James, a hero in Ohio after winning the 2016 NBA championship, has endorsed Clinton. Political pundits don't talk about coal much. But in southern Ohio, it's on everyone's minds. Trains rumble by hourly, often loaded with coal. More than Benghazi, or deleted emails, what people in this part of America remember about Clinton is what she said about coal. "We're going to put a lot of coal miners and coal companies out of business," Clinton stated at a CNN Democratic Town Hall in Columbus, Ohio. That was back in March. But when CNNMoney visited Ohio six months later, it was remarkable to see how many people remembered that line, word for word. Clinton's very next line at that fateful town hall was, "And we're going to make it clear that we don't want to forget those people." But not a single soul that CNNMoney spoke to remembered the second line. Clinton went on to promise to help get coal workers into green energy jobs. Randy Barr just shakes his head at Clinton's green energy jobs vow. "I think they'll say anything to get elected," said Barr, a waste management supervisor, who plans to vote for Trump. "I want someone new, fresh. I want an outsider." Charlie Saltkield, right, speaks with CNN's Poppy Harlow at Diner 23 in Waverly, Ohio. Saltkield plans to vote for Donald Trump. 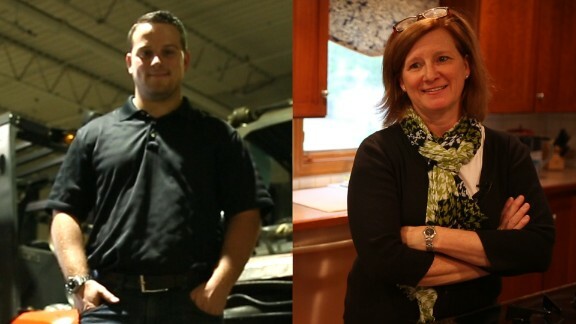 Barr and Saltkield live in Pike County, Ohio, a place that Mitt Romney won by a single vote in 2012. It's the ultimate battleground town in a state that's a toss-up, and Clinton isn't doing well there. 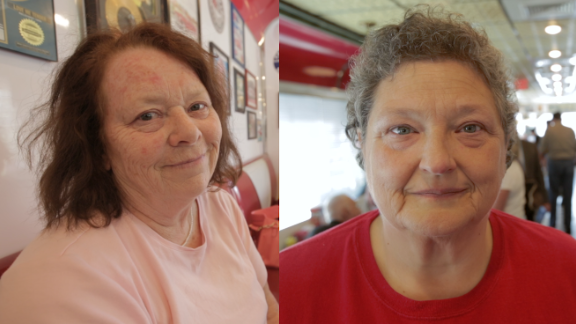 Not even the bombshell video of Trump making lewd and sexually aggressive comments about women has changed these voters' minds. 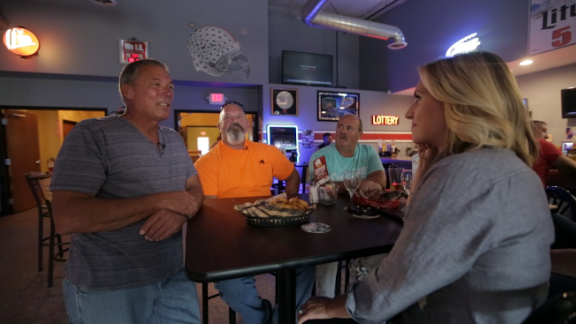 Of all the Trump voters CNNMoney met in Ohio (we interviewed 8 on camera), only one is now on the fence because of the 2005 "Access Hollywood" tape. "I don't want Hillary in there. I'll do everything I can to stop her," Barr said. About a mile down the road from where CNNMoney met Barr and Saltfield lies the Boilmakers Local 105, one of the main union outposts in southern Ohio. A sign out front says, "Foreign made vehicles and products are not appreciated on this property." Donald Trump likes to tout his "tremendous support" among union members. "Workers love me," he has said. In reality, a lot of union workers don't like either Trump or Clinton. "I'm 49 years old. I've voted in every election since I was 18. I'm disgusted," says Scott Hammond. He's spent his adult life working on boilers at power plants -- mostly coal-fired power plants. Scott Hammond is the business manager for the Boilermarkers Local 105, a union in southern Ohio. Hammond is a union guy. Like many union members, he usually votes for a Democrat. President Obama got his vote both times. But he fears Clinton will be even worse for coal. "I'm angry for what [Obama] has done to our business," says Hammond, who is now the business manager of the Boilermakers Local 105. "I think global warming is highly overrated." Hammond isn't sure what he'll do on Election Day. He predicts it will come down to a "coin toss" for him -- and most of his fellow union members. That's not a good sign for Clinton. 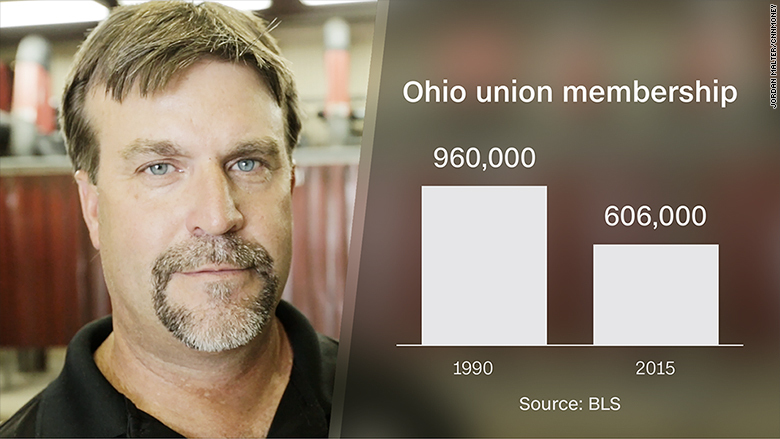 Over 12% of Ohio workers are union members, slightly above the national average. As angry as Hammond is at Obama and Clinton, he sees Trump's appeal to working class men as a total farce. "When Donald Trump went to Charleston, West Virginia, and put on the hard hat, and pretended to be shoveling coal, that was one of the biggest jokes that I've seen in this whole campaign," says Hammond. Related: Is anyone worried about America's $19 trillion debt? 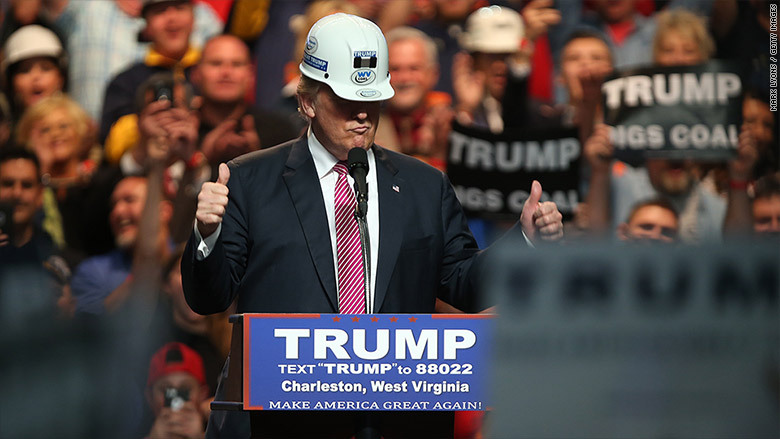 Donald Trump dons a coal miner's hard hat during his rally in Charleston, West Virginia on May 5. About 200 miles away, it's a very different story in booming Cleveland. Once written off as part of the declining Rust Belt, Cleveland has reinvented itself. Smoke stacks from old factories still greet people as they enter the city, but the employer that gets all the buzz now is Cleveland Clinic, a world-class medical facility, that attracts foreign royalty from Jordan and Saudi Arabia. Cleveland's population has held steady at 388,072 in recent years, a cause for celebration after decades of decline. The downtown is teeming with spruced up restaurants and condos. Apartment prices are shooting up because so many young professional are clamoring to live there. "I think [Cleveland] is cool because the cost of living is really reasonable," says Bridget Gallant, who recently bought a home in a gentrifying part of Cleveland at age 27. She's supporting Clinton. And then there's LeBron James. Everyone in town wants to remind you that James and the Cleveland Cavaliers just won the NBA Championship. A mammoth poster of James hangs right by the Cleveland Indians baseball stadium downtown. It's as tall as the old smoke stacks. James, a demi-god in Cleveland, endorsed Clinton in early October, saying, "she will build on the legacy of my good friend, President Barack Obama." Democrats are fearful that the African-American community, which turned out in record numbers to vote for Barack Obama, won't come out as strongly for Clinton in 2016. African-Americans make up over half of Cleveland's population. The concerns may be overblown. "Actually, I'm more excited about her [than Obama]. I really like Hillary," said Sierra Lesley, a stay-at-home mom, told CNNMoney. "I think Donald Trump is not qualified to be the president." CNNMoney spent several hours outside Dave's Market, a grocery store in a predominately African-American neighborhood on the east side of town. Nearly everyone we met was voting for Clinton. In fact, these were some of the most enthusiastic voters we met for Clinton in all our travels through swing states. Jeannie Whittaker, "nearly" 70 and a great grandma to 21, started chanting "Hill-ah-ry! Hill-ah-ry!" during her interview and waving at a passerby who gave her the thumbs up for Clinton. Trump is "just for the rich. 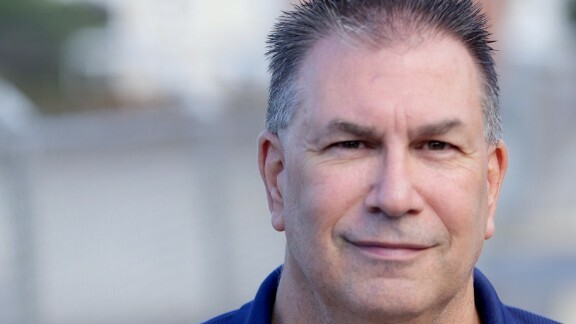 I mean, he's loaded," said Whittaker, a retired security officer who is now on Social Security. "Poor people aren't loaded. We don't have any money, but we tryin'." Whittaker's neighborhood is mainly public housing. It needs "so many things," she says. Mainly, she hopes Clinton will usher in an era of more jobs. "Downtown [Cleveland] looks beautiful. They really built it up, but what about the other parts?" she laments. 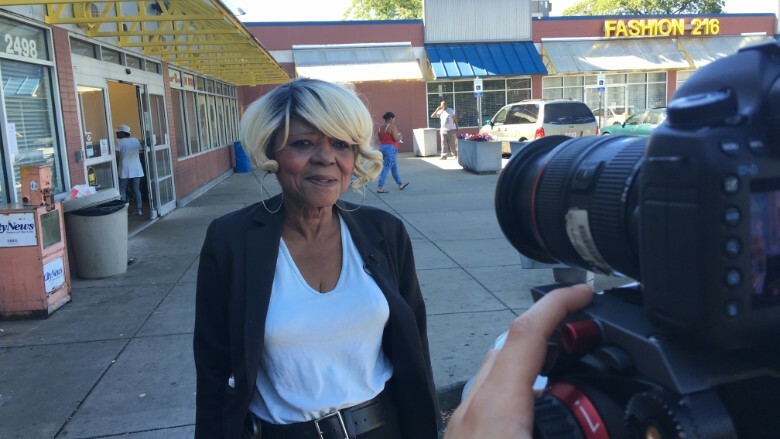 Jeannie Whittaker is a retired security guard and great grandma in East Cleveland. She's voting for Hillary Clinton. 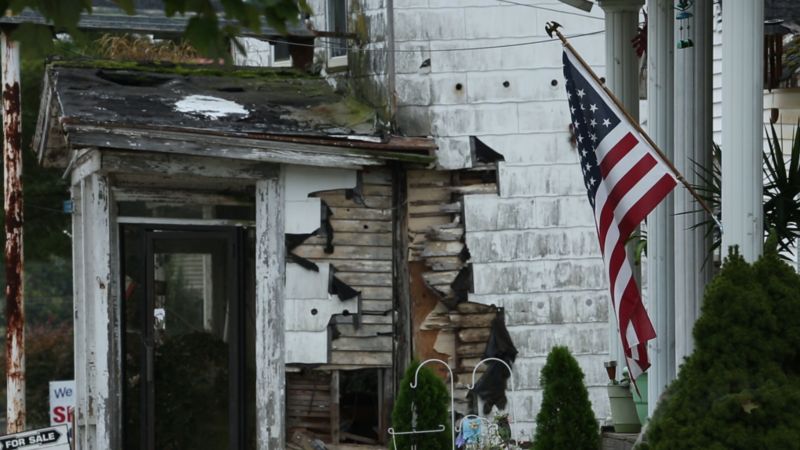 In many ways, the poverty in East Cleveland is very similar to Pike County. Many people receive government aid, especially disability and Medicaid, in both places. But while those in southern Ohio are leaning more toward Trump to rescue their woes, it's Clinton country in the city. "Hillary Clinton is my girl this year, I can't see it any other way," says Samantha Martin, a young professional who moved to Cleveland after college from a "red' part of Ohio. She and her brother are the first in their family to graduate from college. Martin, who is struggling to pay off $60,000 in student loans, works at a food bank in Cleveland. "That's the other side of this really incredible housing boom: All these people getting pushed away by high property rates," she says. But even in East Cleveland, there are signs of a healing economy. 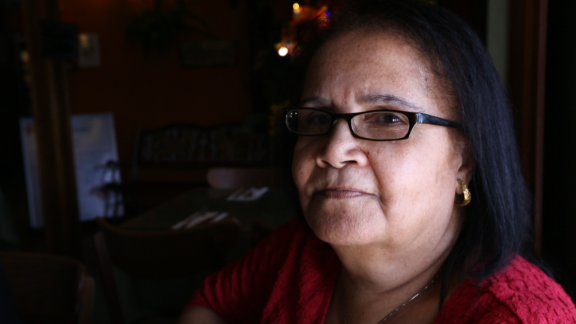 Rowena Washington lives on a block that used to be dilapidated public housing. Now it's middle class homes. These were redone a decade ago with a goal of having people actually buy them. It's become the type of neighborhood where there's a friendly rivalry over which home has the best flowers. "Everybody that comes through [this neighborhood], they say, 'Oh, Wow! It looks different,'" said Washington as she watered her perennials out front. "It's peaceful and quiet." 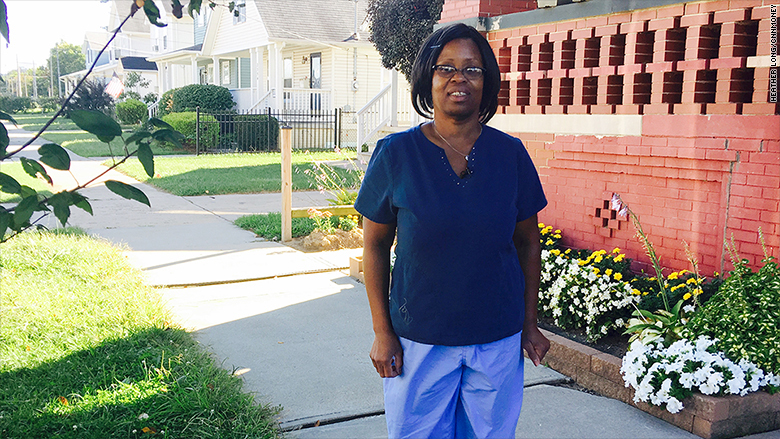 Rowena Washington bought a home in 2008 in an area of Cleveland that totally transformed from public housing to single family homes. She's voting for Hillary Clinton. Washington moved to the area in 2008. She works in a "health care profession" and is a big Clinton supporter. Anyone "would be crazy not to get out and vote for Hillary," said Washington, who went out to vote for Clinton on Ohio's rainy primary day in March. Clinton beat Bernie Sanders by a lot in Ohio. The election in Ohio is likely to come down to voter turnout -- and the final decisions of people like the union workers and Angie Shanks. Shanks owns a real estate company in Pike County. 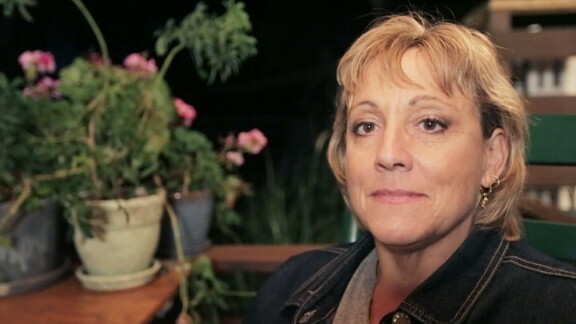 She voted for Obama but isn't happy with how it turned out, especially when the cost of her health insurance tripled. When CNNMoney met her in September, she was leaning toward Trump. "I think Trump is a businessman and the country is a business. It needs to be run as a business," Shanks said then. 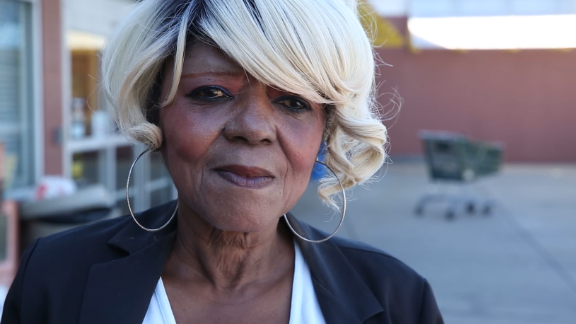 After listening to Trump's vulgar remarks on the 2005 tape, she's not sure she can vote for him anymore. But checking a box for Clinton is tough too. "I'm not sure about Hillary. I'm not sure she's for the Americans as much as she is for herself," Shanks said. Florida Seniors vs. Hispanics: Who will turn out to vote?